Dipodium punctatum¸ the Hyacinth Orchid is a leafless, terrestrial orchid. Usually one or two spikes carry up to 50 deep purplish-red hyacinth-like flowers. The photo shows an exceptional flowering with eight spikes growing close together. Summer is the peak flowering season. D. punctatum is a saprophyte. Plants derive their nourishment from dead organic material. This probably precludes the Hyacinth Orchid from being brought into cultivation. 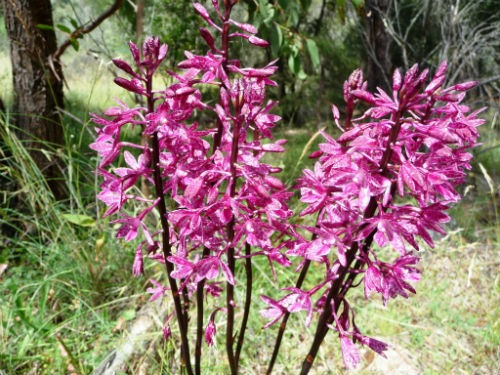 The Hyacinth Orchid occurs in wet and dry sclerophyll forests and grasslands on the coast and tablelands of NSW, Victoria and Queensland. A collection was also made on Flinders Island in Bass Strait. The genus name comes from the Greek and means double foot. This refers to the paired stipes of the pollinia. The species name means spotted.